Yesterday, Beats Electronics released their Beats Pill wireless speaker. The new offering features the company’s Beats Audio technology delivered through a four-speaker system, and this time around, Beats isn’t just courting music enthusiasts; it’s also catering to the conference calling set. The speaker handles all call functions, has a built-in mic for conferencing, and echo cancellation to maintain call clarity. The Bluetooth-enabled model is, according to Beats, the first wireless speaker in stores that boasts both tap-to-pair NFC (Near Field Communications) and apt-X technology, but other than that, the audio specs aren’t available in detail. That leaves us with some questions. For instance, we know there are four drivers, but what size are they? How about a power rating? #audiophileproblems. We acknowledge that Beats products typically do a good job of appealing to their target audience, but hearing is believing. The Beats Pill’s versatility is part & parcel with a new objective of Beats Electronics: transitioning into a freestanding consumer electronics company. Though Beats is unlikely to stray too far from its Producer/President Dr. Dre’s musical roots, it’s clear that the company is aiming to throw its hat into a few more rings. 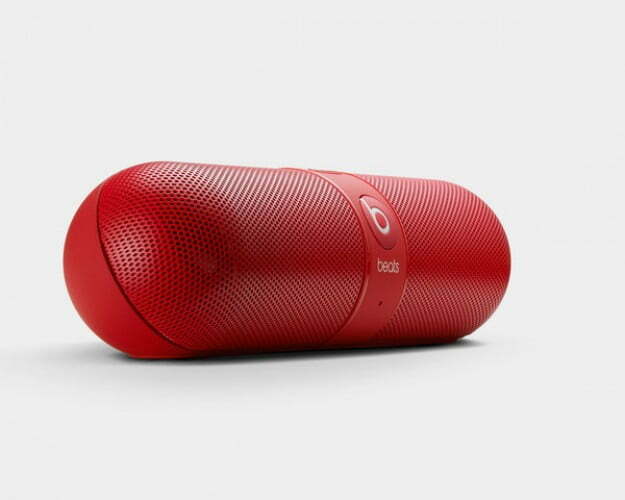 The Beats Pill retails for $200 and is available today at The Beats Store and other authorized locations.